Born: 15 November 1856, Chatteris, Cambridgeshire, England. Died: 12 September 1917, Ascot, Berkshire, England. Sidney H. Farrar, older brother of the mining magnate George Herbert Farrar, grew up in Bedford, England. He was educated at Bedford Public School and in Germany and Switzerland. Subsequently he served an apprenticeship in the engineering works of his uncles, James and Frederick Howard of Bedford and during the eighteen-seventies travelled on their behalf in connection with construction work in France, Germany, Austria, Roumania and Russia. He was elected a member of the Institution of Civil Engineers in 1881. Farrar came to the Cape Colony in 1876 and became a partner in the firm of Howard Farrar and Co. of Port Elizabeth, and later of Johannesburg, constructors of mining and general machinery. In 1880 a Mr S.H. Farrar - presumably him - was temporary secretary of the Port Elizabeth Agricultural and Horticultural Society and served on its committee. He married Ellen Simpson of Port Elizabeth in 1882 and they had two daughters. By 1886 he had moved to the Eastern Transvaal (now Mpumalanga), for in that year a short paper by him on "The gold-fields of South Africa" was published in the Minutes of Proceedings of the Institution of Civil Engineers (Vol. 86, pp. 343-345) in London. From 1887 he acted as consulting engineer to various mines on the Lydenburg gold fields. During 1888 he advertised in the Barberton Herald, describing himself as a civil and mechanical engineer. His services included the provision of plans and specifications for ore crushing batteries driven by either steam or water, surveying water races and tramlines for ore transport, and supervising their construction. In July 1888 he was elected vice-president of the newly founded Barberton Scientific and Literary Society, a position he retained to at least June the next year. At a meeting of the society on 24 September 1888 he delivered a paper on "Water power and its application to gold mining", which was published in the society's Proceedings. At this time he was also a member of the short-lived Barberton Association of Civil Engineers (1887-1888). 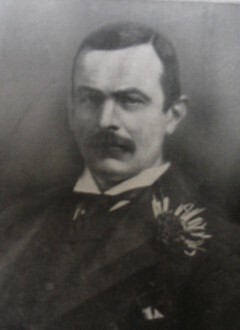 Farrar next moved to the Witwatersrand in 1889, and entered into a partnership with this brother George in the firm Farrar Brothers of London and Johannesburg. From 1889 he acted as consulting engineer for construction to many mining companies on the Witwatersrand. From April to June 1892 Farrar chaired some preliminary meetings aimed at founding the South African Association of Engineers and Architects. He served as joint vice-president of the association in 1892-1893 and 1894-1895, and as a member of council during the intervening year. In 1895 he became a foundation member of the Geological Society of South Africa and was elected as a member of its first council. The next year he was granted a patent for an improved device for attaching wheels, pulleys, etc to shafts. However, he left the Witwatersrand around this time to represent the interests of Farrar Brothers in London. There he became a member of both the Institute of Mining and Mechanical Engineers and the Institution of Mining and Metallurgy, and was elected a Fellow of the Geological Society of London. He represented his firm on the London committees of many mining companies active on the Witwatersrand. Barberton Herald, 6 January 1888 and 22 June 1888: Advertissement, Sidney H. Farrar. Barberton Scientific and Literary Society. Proceedings, 1888-1889. Dictionary of South African biography, Vol. 1, 1968, George H. Farrar. Draper, J.R. The engineer's contribution: A history of the South African Institution of Mechanical Engineers, 1892-1967 (p. 2). Johannesburg: SAIME, 1967. Geological Society of South Africa. Transactions, 1896, Vol. 1, office bearers. Grahamstown Journal, 12 April 1880, p. 2: "Port Elizabeth Agricultural and Horticultural Society". Grace s Guide to British Industrial History. http://www.gracesguide.co.uk/Sidney_Howard_Farrar Retrieved 26 October 2016. Plug, C. Early scientific and professional societies in the Transvaal: Barberton 1887-1889. South African Journal of Cultural History, 1990, Vol. 4, pp. 190-199. South African Association of Engineers and Architects. Proceedings, 1892-1894, Vol. 1, lists of office bearers; 1897-1898, Vol. 4, list of members. South African who's who, 1909, 1917/8.